Boombod do not have a coupon code – Instead they have a 50% discount by slashing their pricing from £29.99 to £14.99 for a weeks supply. 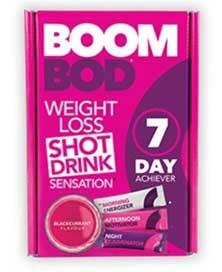 The manufacturer says Boombod 7 Day Achiever is a “weight loss shot drink sensation”. We’ve never reviewed a shot drink sensation before and the name is rather misleading because there is no way this product and the required amount of water is going to fit into a shot glass. Boombod is definitely the ‘must have‘ weight loss product of 2018 for the Instagram generation. The marketing campaign must have cost a pretty penny – it is the weight loss drink promoted by Jordyn Woods. Realistically if you are serious about your weight loss it may be an idea to step away from what is essentially just some glucomannan (with sweeteners) in a sachet. Boombod will most likely curb your hunger. It will not burn your existing body fat, nor will it block new fat from the food you eat. Negatives: In our opinion there are better, less gimmicky products on the market. Can work out expensive. What is Boombod 7 Day Achiever and What Does It Do? The main thing Boombod 7 Day Achiever is designed to do is suppress the appetite and it should be able to do it. The formulation contains a very good hunger suppressing ingredient called glucomannan – the amount provided complies with guidelines set out by the European Food Safety Authority (EFSA). 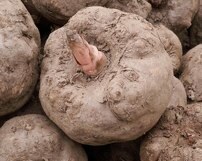 Glucomannan is a water-soluble fibre obtained from the roots of the konjac plant. It has value as a weight loss aid because it’s capable of creating a feeling of satiety. The fibres can soak up many times their own weight in water and the absorption process causes them to expand and make the stomach feel full. The rest of the ingredients in the formulation have more disputable value. Many of them have been added to provide Boombod 7-Day Achiever with a blackcurrant taste (the only flavour choice available) and add some colour. The rest are vitamins and minerals. There are also a heavy sprinkling of flavourings and sweeteners. All three shots are intended to provide appetite suppression, but each one is credited with individual benefits of its own. Shot 1 (Morning Energizer): Provides magnesium, iron, vitamin C, and other ingredients to assist normal energy-yielding metabolism. Shot 2 (Afternoon Motivator): Provides B Vitamins, zinc, and other nutrients that have been added to help dispel mid-day fatigue. Shot 3 (Night Rejuvenator): Provides Vitamin D3, selenium, and biotin to contribute to the maintenance of normal skin and hair. Usage Instructions – Three shots are needed per day. The name on the sachets makes it easy to see which one you need to take and the best time to take them is 30 minutes before meals (breakfast, lunch, dinner). Making the shots is easy. It’s just a case of adding the contents of the sachets to a medium-sized glass and adding some water, stirring all the time. It’s best not to dawdle because the shot is likely to thicken up fast. As soon the glass is 1/4 full it’s time to knock-back the contents and it’s important to follow up with a glass of water. Glucomannan has proven hunger suppressing capabilities and a lot of diet pill manufacturers offer supplements that use it as a standalone ingredient. The important thing to know about glucomannan is three doses are required per day and each dose has to provide at least 1g. Probably the best example of a glucomannan based diet product is LeanBean from Ultimate Life. The EFSA guidelines for using glucomannan also stress the importance of taking each dose with one to two glasses of water, before meals. Anyone uses Boombod 7-Day Achiever and follows the product usage instructions will get the amount of glucomannan and water recommended by the EFSA, so their appetite should be suppressed. Shot 1 appears to be intended to provide extra energy and we see it contains some Vitamin B6. That may do the trick because it helps the body extract energy from food and, for this reason, Vitamin B6 is a key ingredient in Red Bull. Zinc deficiency can reduce energy levels, so the inclusion of zinc is also reasonably valid, but it will only benefit people who don’t get enough zinc from their food. Shot 2 provides another dose of Vitamin B6 and pairs it with Vitamin B12 (also found in Red Bull). It may help prevent mid-day tiredness, but drinking a cup of coffee would probably be a cheaper way to achieve the same thing. Shot 3 is possibly the most interesting because the idea of an appetite suppressant that rejuvenates the hair and nails is unique. However, the presence of biotin should help in this regard. It’s often used in formulations designed to treat hair loss and brittle nails. Glucomannan can cause constipation if it’s not consumed with enough water, but anyone who uses Boombod 7-Day Achiever in the recommended way should not have this problem. However, the formulation contains a lot of other ingredients and it’s hard to predict how they may interact with each other so we suggest all potential users check with their GP prior to commencing supplementation. This is especially important for anyone who has existing medical problems, people using medication, and for women who are pregnant or nursing a child. You can buy Boombod 7-Day Achiever from the manufacturer’s website or purchase it online or in-store from Holland & Barrett. Either way the price is the same. A seven-day supply of sachets costs £29.99. We were unable to find out anything about the company that manufactures this product other than the fact the head office appears to be based in Loughton, Essex; but when a company shares its location it’s always a good sign. Orders can be shipped to the United States, Canada, New Zealand and Australia. It doesn’t ship to South Africa. The good news is Boombod 7-Day Achiever should be capable of suppressing the appetite. But the price tag is very bad news indeed. This is an expensive product and £30 per week is far too much to pay. Plenty of other supplements can provide the same amount of glucomannan and all of them are a lot cheaper to buy. As for the other alleged benefits, most dieters will not place much focus on their hair and nails and those who do could search out a cheap biotin supplement. The only other thing Boombod 7-Day Achiever is likely to do is boost energy levels and most good diet pills can do this too. The best ones provide dieters with help in other areas as well, can speed up the fat burning process considerably, cost less than Boombod 7-Day Achiever, and even have a money back guarantee. This product may be capable of suppressing the appetite, but it’s not capable of delivering good value for money. Without wishing to repeat ourselves we rate PhenQ very highly. 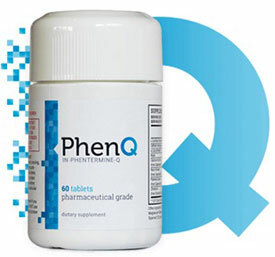 PhenQ can burn existing body fat, stop the creation of new fat and also suppress appetite, it also has anti-oxidizing ingredients in the formula. LeanBean has been subjected to numerous clinical trials and and many positive reviews, comments and opinions.